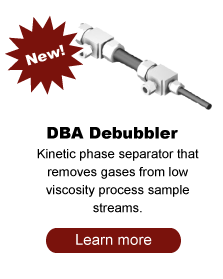 The DBA debubbler assembly is a kinetic phase separator that removes gases from low viscosity process sample streams. The DBA, a degassing apparatus, has been in use since 2004 for the continuous removal of gases from liquid sample streams for on-line analysis. The reliability of the DBA is reflected in the fact that these analyzers are utilized in closed loop control of chemical processes. Application of the DBA has ranged from separating 50-60% gas from organic oxidizer and distillation column sample streams to removing hydrogen bubbles from continuous autoclave samples at 300 C and 180 bar. 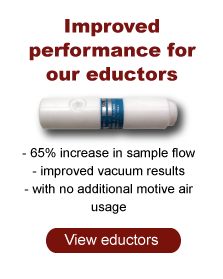 On-line analytical measurements requiring repeatable sample volumes, e.g. process GC, on-line LC, titration, TOC or other waste water measurement. Continuous optical measurements for compositional or color analysis (mid-IR, NIR, Visible, UV) are especially susceptible to light scattering by entrained bubbles. Light scattering from gas bubbles presents significant problems for optical analysis. Why Use the DBA Debubbler Assembly? Material of construction for the DBA is 316 SS. 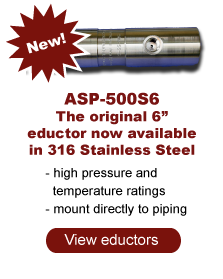 Equipment pressure and temperature ratings can be tailored to your requirements. 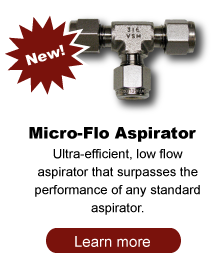 Please contact us with process conditions and design requirements. Contact us at steve@JacobsAnalytics.comor call 423-967-2019 or fill out a Request a Quote form and we will be in touch with you shortly.